What do dogs, water and the Fibonacci sequence have in common? There are many examples of the Divine Proportion found throughout the design of the universe and everything in it. But what do dogs, water and the fibonacci sequence have in common? Water kefir is a light, naturally fermented, effervescent probiotic beverage with a diverse range of flavors and textures. Depending on how you prepare it, your water kefir can be sweet or sour with a texture ranging from light and sparkling to deep and yeasty. It can even become a little bit alcoholic which may be of interest to some (around 0.5% or more depending on how long you ferment it and conditions). Water kefir is made by mixing water kefir crystals or “grains” with water and sugar, and allowing the mixture time to ferment. These grains are actually Symbiotic Colonies Of Bacteria & Yeast (aka, SCOBYs), and come in the form of beautiful, translucent-jelly-crystals. In the right environmental conditions they can more than double in quantity every day! Water kefir grains thrive on a mineral and carbohydrate-rich liquid diet. They can live in sugar water, fruit juices, coconut water, in soy/almond/rice milk, or even honey. Adding whole fruits to your kefir can give your SCOBYs a natural yeast boost, and enhance the flavor. These little grains metabolize sugars into beneficial acids, releasing B vitamins and other healthy enzymes which aid digestion and nutrient absorption. This video explains why a healthy gut is good for you. When making water kefir, there are generally two phases of fermentation. During each phase, the probiotic concentration of your kefir increases and the sugars you have added decrease as they are consumed by the kefir cultures. Kefir fermentation is anaerobic, which means that no oxygen is required for your cultures to work their magic. This is the first phase of fermentation, and takes place with your kefir grains present in the solution. During this phase, your ferment’s flavor and texture is heavily influenced by any fruits or roots present. Fermentation proceeds at a faster rate, due to the large population of microorganisms (kefir grains) present. This phase begins after the kefir grains are removed from your kefir. Your beverage will continue to ferment due to the invisible bacterial cultures still present. Often additional sugar-source (i.e. syrups, fresh fruits, jam) is added during this phase and in a closed vessel or bottle so that carbonation can build. What Kefir Grains Do I Use? First off, make sure you get WATER KEFIR grains. There is a difference between milk kefir and water kefir grains, and they are not interchangeable. Next up, you’ll have to decide if you want powdered, dehydrated or live kefir grains. Powdered kefir has unlimited shelf-life and is ready for immediate use. However, it generally isn’t able to reproduce for more than a few batches of kefir. You will have to keep buying more. Dehydrated kefir grains have a nearly unlimited shelf-life, but you need to rehydrate them for a few days before you can use them. Once they’re out of “hibernation”, they will multiply indefinitely. Live kefir grains are delivered in a sugar-water solution. They don’t live indefinitely without regular care, but they are ready for immediate use and will multiply, providing you with a lifetime supply of kefir grains. If you’ve purchased dehydrated water kefir grains, you will need to “activate” (aka rehydrate) them first. Add ½ cup (100g) of sugar to 4 cups (1L) of warm, dechlorinated water in a clean, non-metal vessel (glass jar or a plastic bottle). Stir till sugar is completely dissolved. Allow the sugar-water to cool to room temperature. Once the sugar water is completely cooled (hot water can kill your kefir!) add 1 tablespoon of dehydrated kefir grains. Do NOT seal the container! Your kefir needs to breathe, and gas build-up in a sealed container could lead to explosions. Cover your jar with a paper towel, or a coffee filter, or a dishcloth, and secure in place with a rubber band. Strain the re-hydrated kefir crystals out of the water and throw away the rehydration liquid - it will not have been significantly cultured by the rehydrating grains and is not so flavorful. Use your activated kefir grains in your first recipe! 1. Make your sugar solution. Add ½ cup (100g) of sugar to 4 cups (1L) of boiled, still warm water in a jar or plastic bottle. Stir till sugar is completely dissolved. Allow the sugar-water to cool to room temperature. 2. Add active kefir grains. Once the sugar water is completely cooled (again, hot water can kill your kefir!) add 1 tablespoon of active kefir grains. NOTE: the more grains you have, the faster they digest available sugars, thus the faster your kefir will be ready. You may need to add more sugar and water. 3. Add dried and fresh fruits. The extra yeasts from the skin of the fruits help the fermentation process as your kefir grains eat the sugars and create more carbonation while adding fruity natural flavours. NOTE: over-carbonation can be dangerous, especially in glass containers! Open the cap every 1-2 days to release air-pressure and to avoid explosions. 5. Watch your ferment. After 48 hours, the fruit that sank to the bottom of your jar should now be floating at top. This means carbonation and fermentation are happening! 6. Pour the flavorful, effervescent liquid into a bottle while straining out the kefir grains.Place your grains in another sugar-water solution. These happy fellas have probably doubled in quantity, and are ready for your next ferment. NOTE: You are what you eat, and your water kefir grains are no different. Expect them to change color according to the sweeteners, flavours and added ingredients you ferment them with. When you use hibiscus tea and honey to make a ferment it changes the grains pink! 7. The liquid product, now separated from the grains, is “Water Kefir’ and will continue to ferment and carbonate in the sealed bottle (secondary fermentation). This beverage can be cooled and enjoyed as is. Optionally, you can enhance it further with herbs such as mint and cardamom, sweeteners such as sugar or honey, and various flavored syrups. You can even use it as a “starter” for other sodas & vegetable ferments, or instead of yeast for baking... the possibilities are limitless! NOTE: Your final beverage will have MUCH fewer calories than your initial ferment. Water kefir feeds on sugars, digesting them and releasing CO2 (carbonation) in the process. Water kefir bacteria can eat maple syrup and agave syrup, unlike kombucha cultures. Sugar-free sweeteners such as stevia will NOT feed your kefir, but feel free to add it to your finished product for an low-calorie sweet taste! 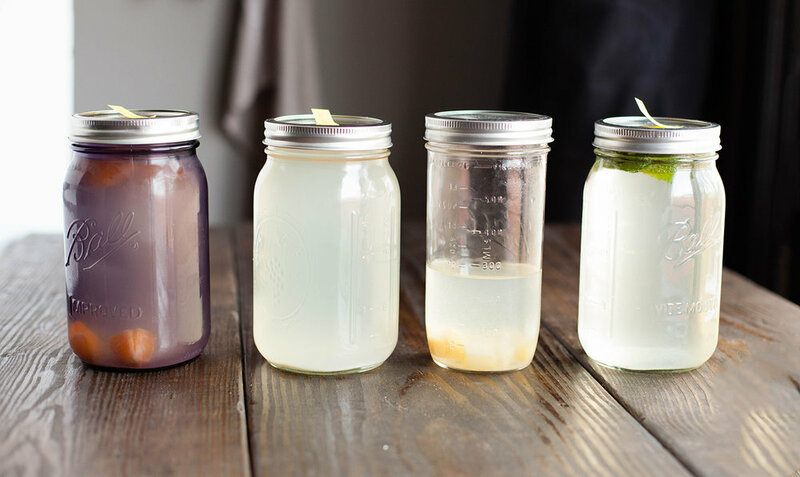 Now that you have the basic recipe for making water kefir, it’s time to start experimenting! Keep at room temperature. Your kefir ferments best at a room temperature environment (again, if they are kept in cooler places, they are less active and need to be fed less often). Refresh sugar-water. As your grains ferment, over time they create a sour, acidic environment. For our digestion and palate this is great, but an environment that is too acidic can be harmful to your grains. If you don’t regularly change their sugar water (strain and reintroduce into a fresh sugar water solution), the organisms in your kefir grains will “pickle” themselves, eventually dying and then decomposing into nothing in their liquid habitats. Mid-term storage. Going away for up to 2 weeks? Put fresh your grains in a fresh sugar-water solution and place in the fridge to slow fermentation. Long-term storage. Going away for a longer than 2 weeks? Strain your grains into a plastic bag or freezer safe (non-metallic!) container, and place in your freezer. They can survive for months in this “hibernation” state. When you are ready to use them again, put the ice-chunk of kefir grains back into a sugar-water solution, where it will thaw and start eating again. Add some “welcome-home” fruits, a cleaned eggshell for extra calcium, or a pinch of baking-soda for minerals. Too many grains? They multiply fast, and this can easily become an issue for you. Try dehydrating your grains using a dehydrator, or simply spreading them out on a plate with good air circulation. As long as the grains are not heated to a temperature over 130 degrees, they will not die and can be re-hydrated when the time comes. This is also a great method for people moving overseas or as a backup! Vessels and Equipment. I prefer using glass as it’s transparent, I can see what is happening inside and there is no chance or plastic leaking anything into my kefir to hurt me or my kefir grains. Stainless steel can work, but again, you can’t see what’s happening inside, and I like to avoid using metal whenever possible as metal is an irritant to the grains. One exception is the strainer. If you have a plastic sieve, great, but brief contact with a metal strainer is not a problem. Interested in reading more? This article was inspired by https://ediblealchemy.co/water-kefir/ Check it for further inspiration!